'Green Eggs And Ham': A Quick Political History : It's All Politics Sen. Ted Cruz isn't the first politician to lean on the classic children's story to advance his cause. Governors, lieutenant governors and even the president have held public readings. 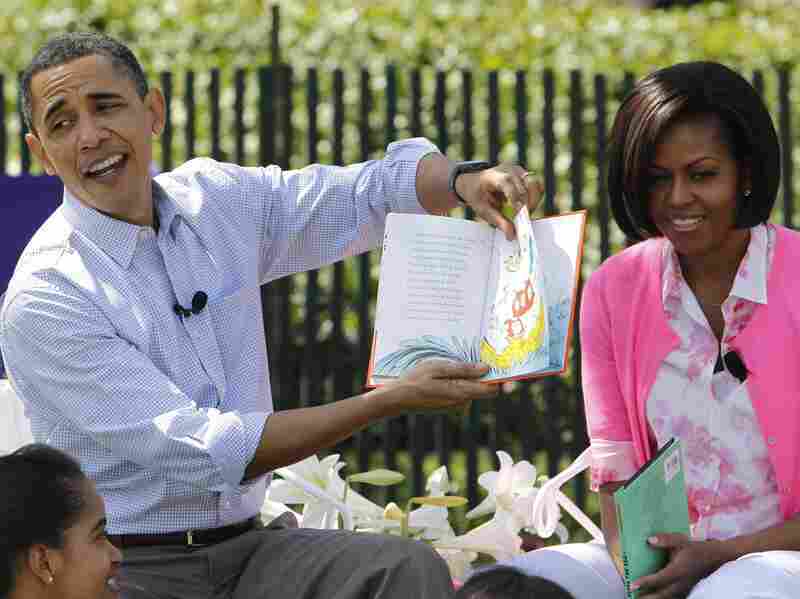 President Obama, accompanied by first lady Michelle Obama, reads Green Eggs and Ham at the annual White House Easter Egg Roll in April 2010. During the fifth hour of his televised marathon speech protesting Obamacare, Texas Sen. Ted Cruz caught the attention of Dr. Seuss fans everywhere by pulling out a copy of Green Eggs and Ham on the Senate floor to read as a bedtime story to his children. He noted Tuesday that it was his favorite childhood book, and even pointed out that his father had invented his own version of green eggs and ham, the food Sam-I-Am famously encouraged the book's unnamed narrator to try. Although he may have squeezed the most attention out of his dramatic Seuss reading, Cruz is far from the first politician to lean on the classic children's story to advance his cause. The former Democratic presidential candidate and civil rights activist read the story on Saturday Night Live following the 1991 death of Theodore Geisel (better known as Dr. Seuss). His serious yet comical reading was a big hit for the late-night sketch comedy show and remains popular two decades later. Pawlenty, a former two-term governor and GOP presidential candidate, acknowledged his taste for green eggs and ham not long after first taking office in 2003. He made the admission to a group of children after a playful line of questioning with Judy Schaubach, the president of the Education Minnesota union, at an event the governor hosted to promote Read Across America Day. The president attempted "to do the best rendition ever of Green Eggs and Ham" to a group of children at the 2010 White House Easter Egg Roll. With some help from the first lady, Obama gave an animated reading and encouraged the kids to try new things — even green beans and peas. The Oklahoma Republican read the book to a group of kindergarten students at the state Capitol as part of her early-childhood-education push. Afterward, Fallin even gave each child a copy of the book and encouraged their parents to read to them daily. Brown, a Democrat who's running for governor in 2014, hosted a Green Eggs and Ham-themed breakfast for 62 Annapolis-area elementary school students in March 2012. The Cat in the Hat, Thing 1 and Thing 2 — all famous Dr. Seuss characters — were in attendance and posed for pictures with Brown and the children.